Oil States Merlin® connection is, for the first time, being used to assist in FLNG installations utilizing our water uptake riser. Our connections offer a long conduit to provide cooler water from deeper depths for FLNG processing, allowing smaller, more efficient topside facilities. 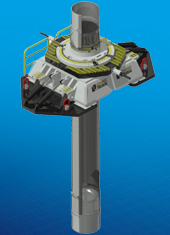 Current designs are based on our Merlin® tendon tether connection, which has been used for tethering TLP platforms to the seabed for the last 25 years and can be geometrically sized specifically for the project. Oil States offers the complete package, Merlin connections welded to pipe and spacers per client request. See Merlin® connector animation here. See FLNG water uptake riser animation here. Track record of 40,000+ Merlin connections supplied over 30 years and currently installed and in service. In-house engineering group for detailed analysis of connector performance. Fast, non-rotational makeup allows effective bundling of risers.